You were just in an accident. You are still at the scene and your head is spinning with all of the instructions you have ever been told about what to do next. Luckily, you pay diligently for your car insurance. Plus, some other insurance company has a really caring advertising campaign about how “you are in good hands”, or something similar. We see it time and time again at Robert Armstrong Law. Unfortunately, all insurance companies tend to have the same priorities after a car accident: protecting their own interests. Robert Armstrong wants you to know what actions to take to keep yourself safe, your rights intact, and to protect you from insurance companies taking advantage. Stay at the Scene and check on all drivers and passengers for safety. Leaving the scene and/or failing to check on the other people involved can open you up to perhaps baseless allegations from insurance companies and lawyers. You could be accused of a hit-and-run. 2. Exchange information with the other driver and DO NOT APOLOGIZE WHEN YOU ARE NOT AT FAULT. Obtain information: names, numbers, addresses, driver’s license numbers, license plate numbers, make/model of vehicles, and basic insurance information. If you do not have any information about the other vehicle or driver, ask the law enforcement officer for the other drivers information. 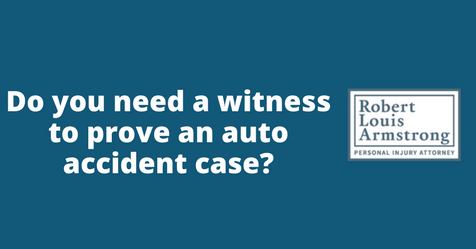 If there are witnesses, request to obtain their name and numbers as well as witnesses can make a big difference in your case. Never apologize or admit to wrongdoing. It is tempting to apologize for everyone’s stress and worry and/or to reflect on what you could have done to prevent this. Apologizing can make you vulnerable to insurance companies claiming that you have admitted fault. If anyone is in need of medical attention call 911 immediately. If anyone is injured and/or there is significant property damage that you even think might lead to an insurance claim, call the police to have them file a police report. Ask for their name and badge information. Insurance companies have a more difficult time wiggling out of their responsibilities when a police report is telling them what happened. Take pictures of the damage to your vehicle and if possible the other vehicle as soon as possible. Ideally, your photos will have a time stamp and will be from the actual scene. If the cars need to be moved to protect against further accidents, that should be the priority, but only move after you have been instructed to do so by the law enforcement officer. If possible try to get pictures from the accident itself. At minimum, try to provide pictures either from the scene and/or of the damages to your vehicle after to your insurance company as soon as possible so that no one can cast doubt on whether the damage to your vehicle was really from the accident. What next? Insurance Companies are about to get a lot more involved in your case. It is about to be more important than ever that you continue to protect your rights throughout the claims process. 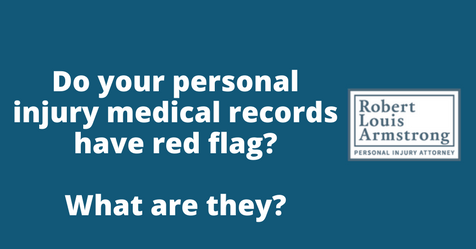 Do your personal injury medical records have red flag? What are they? Unfortunately, when it comes to personal injury claims against insurance companies, insurance companies will always try to offer you less money than you deserve to compensate you for injuries you sustained in a car accident. That’s just the way the insurance business works. An experienced personal injury attorney like Robert Armstrong will work tirelessly to make the insurance companies pay what they owe, but often there are “red flags” that insurance companies look for in your medical records as a way to justify paying you less money. What are some of the red flags that insurance companies will identify? Degenerative changes – Degenerative means that your symptoms are chronic and that your condition continues to deteriorate or is irreversible. If your symptoms are degenerative, it will usually show up on tests like MRIs and X-rays. Typically, degenerative conditions are caused simply by the aging process, but degenerative changes could start to appear in your body as early as your 20s, so degenerative characteristics could realistically show up on almost anyone’s imaging tests. Insurance adjusters are quick to point out soft tissue injuries and claim that they are degenerative changes and not the direct result of a car accident. With the help of a good lawyer and the honest testimony of a medical professional, it could be proven that you weren’t having any discomfort or symptoms before the crash, even if there are degenerative signs that show up on your MRI or X-ray. Pre-existing conditions – If you broke your arm in a car accident, and it just so happens that you broke the same arm in a skateboarding accident two years ago, an insurance adjuster could try to link your current pain and aftermath of the injury to your last painful injury. The same could hold true for prior car accidents, slip-and-falls, or any other pre-existing injury. That’s why it’s so important to have the testimony of a doctor or other medical professional. Treatment gaps – If your doctor recommends that you go to physical therapy once a week, and records show that you consistently miss appointments and aren’t following your doctor’s orders, it could be a big red flag for the insurance adjuster. It’s common for crash victims to try to heal on their own without having the inconvenience of seeking medical treatment, but it’s important you don’t do that. Remember that an insurance company will do everything in its power to try to prove that you haven’t been completely honest and forthcoming about your injuries. Don’t give them any leeway. There are many other red flags that could show up on your medical records, but with the help of an experienced personal injury attorney you can still get the settlement you deserve. If you or someone you love has been injured in a car accident, contact Robert Armstrong’s office today for help. https://www.rlaattorney.com/wp-content/uploads/2017/10/Do-your-personal-injury-medical-records-have-red-flag-Robert-armstrong-personal-injury-attorney-north-carolina.png 249 476 robert https://www.rlaattorney.com/wp-content/uploads/2016/09/RLA-full-white.png robert2018-01-17 07:59:482017-11-21 13:07:50Do your personal injury medical records have red flag? What are they? Should Your Car Accident Claim Include Pain and Suffering? You might have heard the term “pain and suffering” in association with lawsuits, but what is it — and is it prudent to go for pain and suffering in your car accident claim? Pain and suffering is a legal word that describes a wide range of injuries you might have suffered if you were in a car accident. That’s not just physical pain. It could also include emotional and mental trauma, like losing sleep, depression, worry, inconvenience and loss of quality of life. Pain and suffering is included in the “non-economic” side of damages, i.e., it’s not easily seen on paper in the form of medical bills, lost income, the cost to fix your car or buy a new one, and other things like that. Pain and suffering isn’t an easy thing to calculate. How do you put a number on emotional distress, anxiety and fear? Although there’s no written statute on how exactly it is determined, there are ways that it can be factored in, and with the help of an experienced personal injury attorney you should receive a fair amount of money for your pain. What factors are considered in pain and suffering? How much physical pain and overall discomfort are typically associated with your injuries? How have your injuries affected your life? Are you unable to play sports? Are you unable to be a good partner in your relationship? Does your injury prevent you from your hobbies? How long will it take you to completely heal from your injuries? Are you on pain medication for the long-term, or are you required to have long-term physical therapy? What methods do adjusters and lawyers use to determine pain and suffering? Multiplier – this is a number based on your economic damages — a multiple of your medical bills and lost income. How do you negotiate a higher amount of pain and suffering? Getting the most for your injuries, as well as your pain and suffering, is a job best left up to an experienced personal injury attorney. He or she is able to better gauge the severity of your injuries and the potential monetary value of your pain and suffering. These monetary awards can vary from a few hundred dollars to thousands of dollars. There’s a lot at stake. 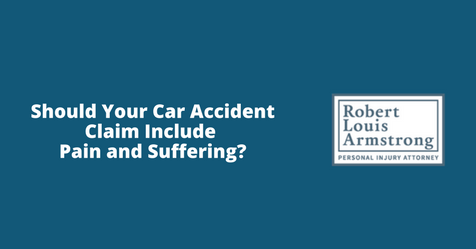 https://www.rlaattorney.com/wp-content/uploads/2017/09/Should-Your-Car-Accident-Claim-Include-Pain-and-Suffering-Robert-armstrong-personal-injury-attorney-north-carolina.png 249 476 robert https://www.rlaattorney.com/wp-content/uploads/2016/09/RLA-full-white.png robert2017-11-29 07:41:162017-11-21 13:02:28Should Your Car Accident Claim Include Pain and Suffering? Your Car Accident Injury Claim: Settle or Sue in Court? It’s fun to imagine a dramatic courtroom and a judge or jury handling your car accident claim, but the reality is that most car accident injury claims are settled without a lawsuit ever being filed — and the ones that are filed don’t usually make it all the way to trial. Sometimes, it’s necessary and better for the injury victim to go to court and let a judge or jury hear your case. Other times, it’s more practical to pursue a settlement. Each case is different, and there are many factors at play. What are the advantages to settling your car accident injury claim? Your attorney costs could be lower — Litigating personal injury cases through the court system is a very costly undertaking. This could affect your settlement amount in the end. You don’t take the chance of a jury or judge not ruling in your favor — i.e. you don’t end up with a settlement amount of 0 dollars. You avoid the headaches of dealing with court hearings, depositions and other elements of a trial — Taking a case all the way to trial is a very long process. We’re talking months, if not years, in some cases. In the meantime, attorneys for the defense will likely do things that will try to “wear you down,” like looking into your personal life and threatening to disclose details in court that you don’t want shared into a public record. You don’t have to deal with the appeals process post-trial — Even if a judge or jury rules in your favor and awards you the amount of money you deserve, the defense can — and often will — file appeals and post-trial motions that could seriously delay you getting your check. You might get more money — If you take your case to a judge or jury and prevail, you might be rewarded with a much higher amount of money than the insurance company would have settled for. You have a better chance of recouping all of your out-of-pocket costs – If a judge or jury rules in your favor, all those little expenses that you did not foresee coming after your accident could be repaid to you. Ultimately, you should always consult with your attorney before deciding whether to settle or file a lawsuit. He or she is the best person to help you make that decision. If you or someone you love has been injured in a vehicle accident, contact Robert Armstrong’s office today. 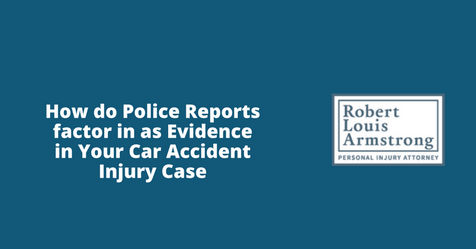 https://www.rlaattorney.com/wp-content/uploads/2017/09/Your-Car-Accident-Injury-Claim-Settle-or-Sue-in-Court-Robert-armstrong-personal-injury-attorney-north-carolina.png 788 940 robert https://www.rlaattorney.com/wp-content/uploads/2016/09/RLA-full-white.png robert2017-10-06 07:15:342017-09-05 15:21:16Your Car Accident Injury Claim: Settle or Sue in Court?